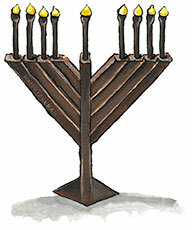 Chocolate Menorah for sale. Buy online at Zingerman's Mail Order. Gourmet Gifts. Food Gifts. We’ve been hunting for Chanukah gifts like these for years and we finally found this Kosher work of art from master French Chocolatier, Michel Cluizel. Each candle is cast in solid dark (55%) chocolate from the base to the flame. A fun, clever and delicious way to celebrate the holiday. About 6 inches long, 5 inches tall, 100% delicious. Quantities limited.